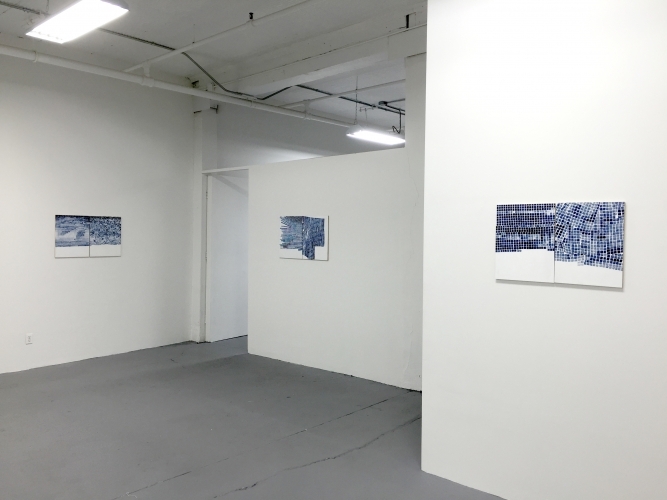 Installation view, Marjorie Welish, “Some Differences,” ART 3 gallery, Bushwick, Brooklyn, NY. Through December 18, 2016. Contributed by Sharon Butler / Followers of post-election news coverage, despairing over rampant voter suppression, are bereft over the Electoral College electors’ unwillingness to cast their votes for the sane candidate who overwhelmingly won the popular vote. 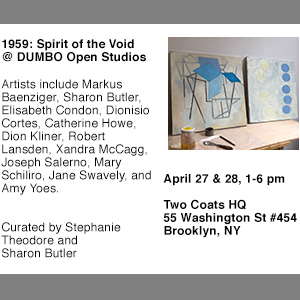 The vocal majority, fretting about what to expect after the inauguration of an undisciplined kleptocrat as the 45th president of the United States, will recognize their heartache in the delicate diptychs Marjorie Welish presents at Art 3 in Bushwick through December 18. 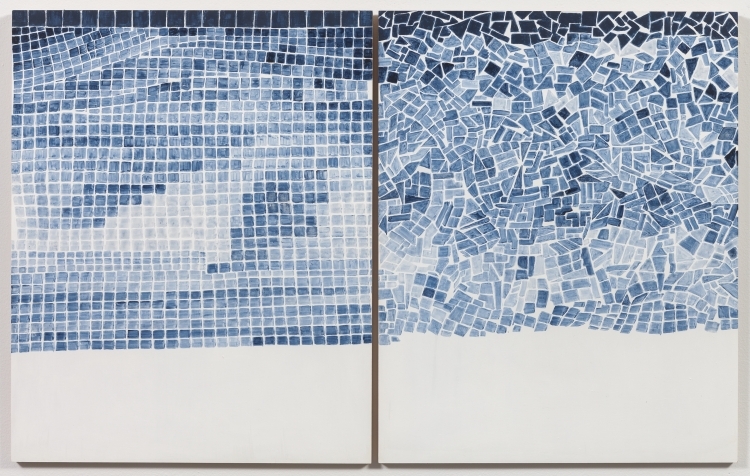 Each diptych comprises two stark white panels, partially covered with fringe-edged, mosaic-like squares of paint. Exploring notions about repetition and difference, Welish adopts a different approach to paint each panel. The effect is often grid-like, but the squares are untethered and structurally unstable; the sturdy certainty that we have come to expect from the familiar grid format has gone missing. 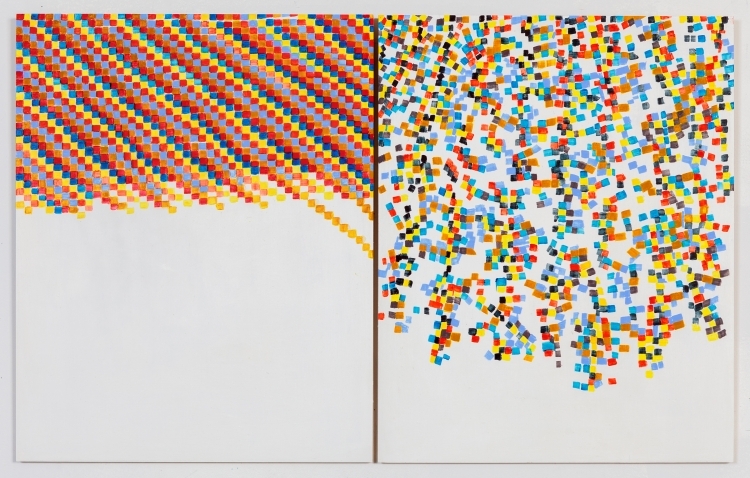 Marjorie Welish, Before After Oaths 1, 2012, acrylic on panel (diptych), 20 x 32 inches. On the left, pre-determined colors in a pre-determined sequence. On the right, the same color palette of two reds, two yellows and two blues, introduces a change of procedure, which in turn induces a change in structure. 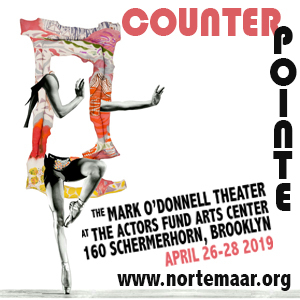 Marjorie Welish: By moving from left to right I keep the mark but reorient its patterned patches as sufficient to create a change—a procedural difference that has conceptual consequence. Other possibilities put into effect: to move from left to right is accompanied by the decision to feature irregularities in spacing, with sparseness or density. To paint with a brush introduces all kinds of contingencies into the mark—especially pronounced in the several works done in all gray—Payne’s Gray, to be exact. Lilly Wei: Why is Payne’s Gray so significant to you? MW: The point is that holding to the uniform tone of Payne’s Gray allows for calibrating difference. It was through Payne’s Gray that I introduced the concept of difference as differentiation. Many of the diptychs one sees are not binary, not differing in structure but differing in mode. With its translucency not so easily controlled, using Payne’s Gray aids the improvisatory aspect throughout: as gradients cultivated in developable indeterminate folds subject to cramping, then abrupt breaks. This gray has wonderful properties. 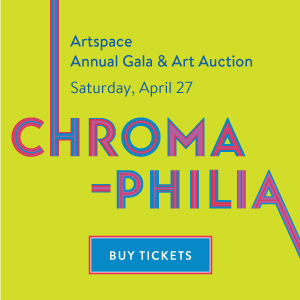 It can be dark or darkest, blue and/or gray with an aura. It is a metamorphic color. Such differentials emerge through an iteration of difference, and if not radical, are generative of ramified or perturbed orders. LW: Essentially, then, you are changing the instructions that you gave yourself. MW: True. Some are structurally antithetical; but several are not, as I go from left to right to reorient the translucent tone in regular folds where it had been circumstantial. Passing from left to right across the gap in other diptychs insists that change allow for irregular shape, and so an erratic orienting of the field. In another work I predetermined that brushwork go from horizontal to vertical, and from where spacing diverges on the left margin of the left panel to the gaps within the field on the right panel. It is easy to see the differentiation here. In another couple of works internal spacing is generative of major change across the gap and throughout the field where complexities expressed difference within repetition. 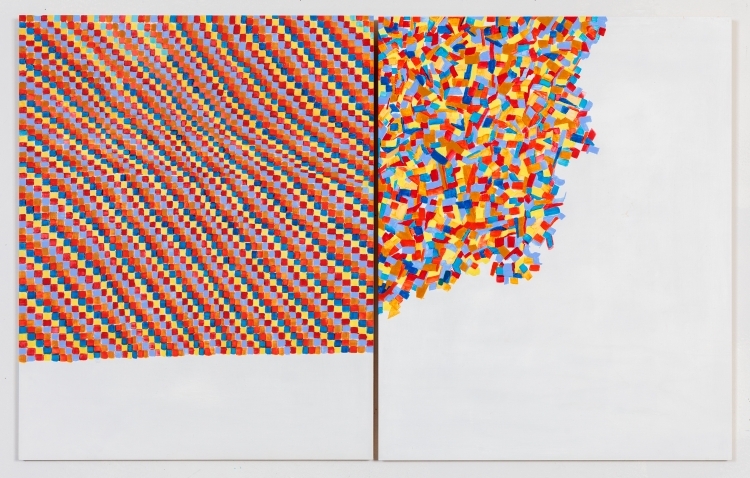 Marjorie Welish, Before After Oaths 3, 2012, acrylic on panel (diptych), 20 x 32 inches. On the right, the same color palette of two reds, two yellows and two blues, introduces a change of procedure, which in turn induces a change in structure. 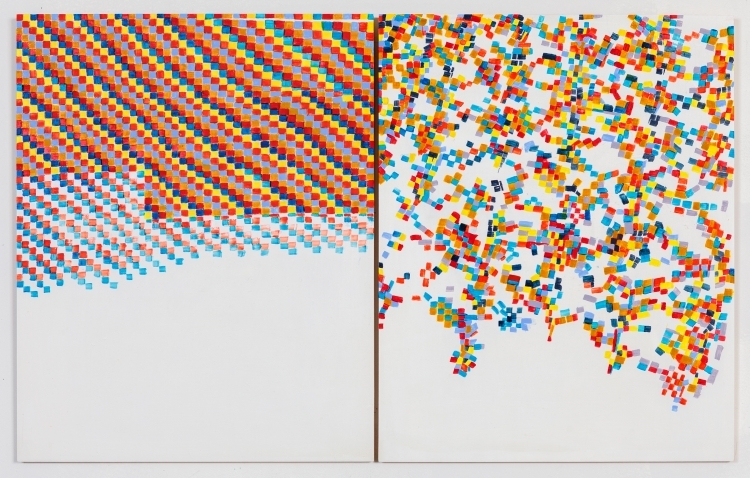 Marjorie Welish, Before After Oaths 5, 2012, acrylic on panel (diptych), 20 x 32 inches. On the left, pre-determined colors in a pre-determined sequence. On the right, the same color palette of two reds, two yellows and two blues, introduces a change of procedure, which in turn induces a change in structure. 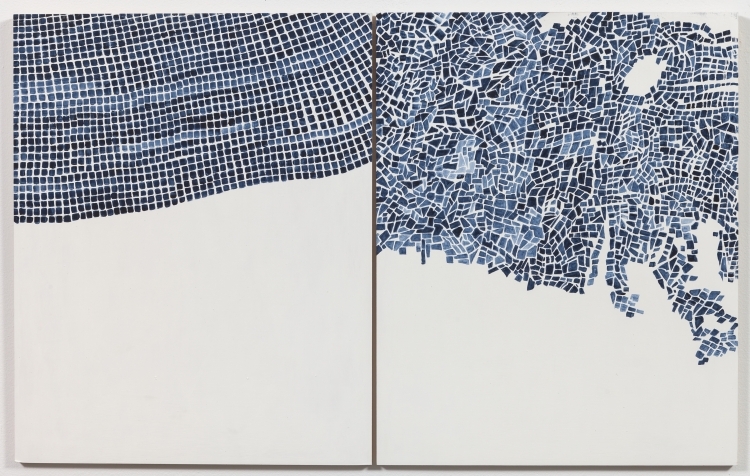 Marjorie Welish, Before After Oaths Gray 2, 2013, acrylic on panel (diptych), 20 x 32 inches. In this diptych, the deposits of the pigments faded as the artist proceeded. On the left panel, the fades occurred naturally, on the right panel the artist deliberately guided the fades to create falls. 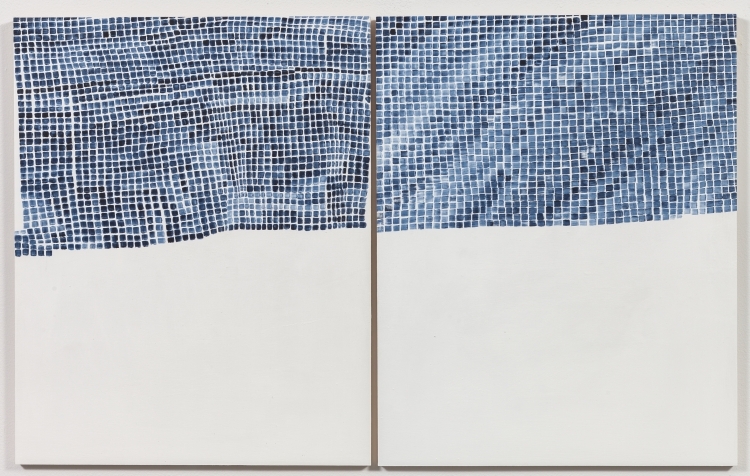 Marjorie Welish, Before After Oaths Gray 4, 2013, acrylic on panel (diptych), 20 x 32 inches. Allowing the orientation to drift, the artist then introduced a change of shape in the unit itself, which induced anomalies in spacing. 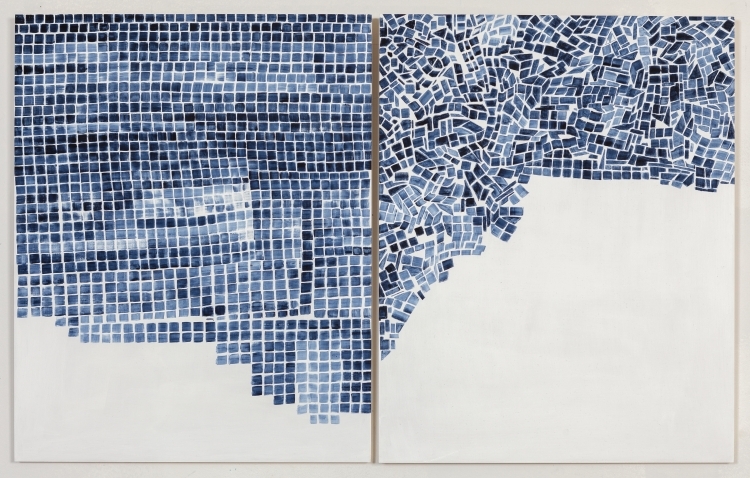 Marjorie Welish, Before After Oaths Gray 6, 2013, acrylic on panel (diptych), 20 x 32 inches. Consistently opaque at the top to start, left and right fade differently: the left allows for gradients, the right allows for erratic composition—like mosaics at odds. Marjorie Welish, Before After Oaths Gray 7, 2013, acrylic on panel (diptych), 20 x 32 inches. Keeping the mark the same throughout, difference may be understood as a shift to scaling or imbrication, as well as a shift from predominantly dark to predominantly light. Welish’s elegant paintings explore the butterfly effect–the theory that small perturbations like the flap of a butterfly wing can produce estimable consequences over time. She reminds us that change is the inevitable outcome of endeavor. But that doesn’t mean we shouldn’t be very, very worried. “Marjorie Welish: Some Differences,” curated by Silas Shabelewska. 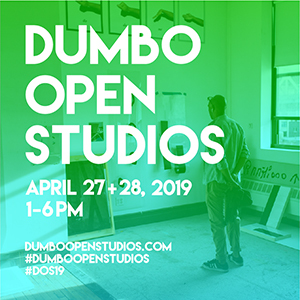 ART 3 Gallery, Bushwick, Brooklyn, NY. Through December 18, 2016.